This piece was featured on South Dakota Public Radio. A constitutional amendment to establish nonpartisan elections in South Dakota may be on the ballot in 2016. The amendment seeks to stop candidates from running under the title of democrat or republican. The constitutional amendment is controversial for some Democrats and Republicans. Rick Weiland is the chair of South Dakotan’s for a Nonpartisan Democracy. He says the amendment will lead to better public policy. “It shouldn’t be about the wellbeing of a country based on whether or not you’re a Democrat or Republican. We’re all citizens of the greatest democracy in the world and we need to come together. There are challenges that we face as a country here in the United States and around the world—Issues that have got to be tackled. But if all we can do is stand up and beat the drum, this partisan drum, and this unwillingness to cross the isles and work together to solve these problems, we’re never going to get at them,” says Weiland. Not everyone agrees that nonpartisan elections would be a benefit to voters. 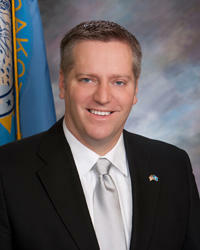 Brian Gosch is the Republican Majority Leader in South Dakota. He says it’s easier for voters to make decisions when they know a candidates party affiliation. “I think it’s an attempt to get more democrats elected. I mean each party has a goal of getting as many of their candidates elected as possible. And more recently in South Dakota republicans have won more elections whether it be at the legislature or statewide offices which only republicans hold those positions right now. So if you’re not getting it done based on ideas and policies you support then you have to look for other means to get elected, or to try to get your candidates elected,” says Gosch. “Having been a life-long Democrat, a proud Democrat, a strong Democrat-I really do believe that the party label has gotten in the way of good public policy. That we can get at these problems without having to always get at each other,” Weiland says. If the signatures are verified by the Secretary of State, the constitutional amendment for nonpartisan elections will appear on the November, 2016 general election ballot.